This variation was originally called the Lasker-Pelikan Variation but was researched and revitalised from Evgeny Sveshnikov and Gennadi Timoshchenko and is now named after Sveshnikov. This opening was first played in the chess world championship 1910 by Emanuel Lasker against Carl Schlechter. Black has a weak square on d5 which gave the opening in earlier times a bad reputation, but the Sveshnikov Sicilian is nowadays a respected and popular opening and was played by famous players like Wladimir Kramnik, Joel Lautier und Péter Lékó. It was also played in the World Chess Championship 2012 in Game 5 by Boris Gelfand. If you intend to play the Sicilian with Black then you should study the Sveshnikov Variation as well. Best is to get some decent books about the Sicilian. Get good Chess Books and DVDs here! 6.Ndb5 (threatens Nd6+) (6.Nf5 allows 6...d5! 7.exd5 Bxf5 8.dxc6 bxc6 9.Qf3 Qd7) if the knight moves somewhere else Black plays ...Bb4 and puts pressure on e4. Black should not allow 7.Nd6+ Bxd6 8.Qxd6 as White has a pair of bishops and therefore slight advantage. White likes to trade of the knight, as this will weaken the d5-square even more. Black drives the white knight back to a3. 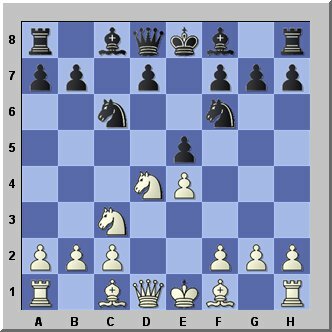 The move b5 was invented by Sveshnikov, which controls c4 and threatens to fork the white knights.